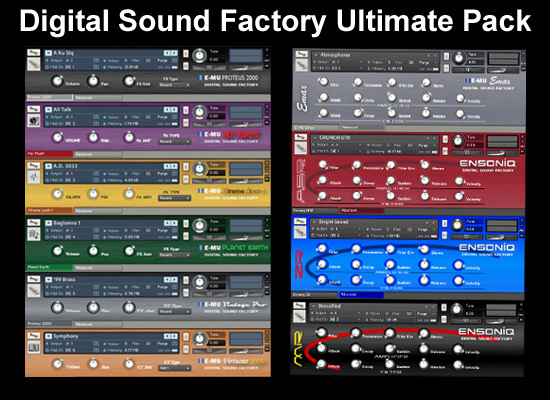 We had a very succesful deal at the end of last year where we offered the Digital Sound Factory Proteus Pack. As you may remember what sets the Digital Sound Factory sounds apart from the others is that Digital Sound Factory has acquired the exclusive rights to the original Proteus hardware sound ROM’s and has remastered this legendary content for software synthesizers. Starting with the original waveforms, DSF has programmed over 3,500 instruments used in the Proteus hardware to be compatible with modern software synthesizer formats. So these sounds are way more than resampling classic hardware, they have access to the original data that created these classic sound modules. Requires full version of Kontakt 3.5 or greater. Also available in SoundFont (SF2) and Logic EXS24 formats.